111.08 gram 22 kt Fancy Dimpled Curb Style Gold Necklace | ?? Wearable wealth: 22 k gold necklaces at near bullion prices. This necklace is an easily transportable and discerning way of preserving your wealth. This product features 22k gold, fine craftsmanship and is a fancy dimpled curb style necklace, with divots on one side. 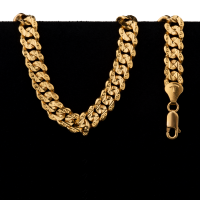 The 25 inch chain length includes a lobster claw clasp. Dynamic Bullion pricing means that you can save on your purchase as gold prices fluctuate. 111.08 gram 22 kt Fancy Dimpled Curb Style Gold Necklace Wearable wealth: 22 k gold necklaces at near bullion prices. This necklace is an easily transportable and discerning way of preserving your wealth. This product features 22k gold, fine craftsmanship and is a fancy dimpled curb style necklace, with divots on one side. The 25 inch chain length includes a lobster claw clasp. Dynamic Bullion pricing means that you can save on your purchase as gold prices fluctuate. Metal weight displayed in details is the gold content only.